This homemade costume for groups entered our 2013 Halloween Costume Contest. Kelly, Sylis, and Chloe Vasquez as Thee three blind. The idea came from a school library book that Kelly, the oldest of the three, had brought home. The costumes were easy and fairly inexpensive to make. The ears were probably the hardest part to make. With an old gray shirt,a gray head band, pink fabric and a glue gun I put together the ears. The outfits are simply put together with gray leggings, a grey long sleeve shirt and a piece of white fabric. tails made from bought, costume pig tails straightened out. The walking sticks were apart of an old tent that I broke apart and painted the tips red. 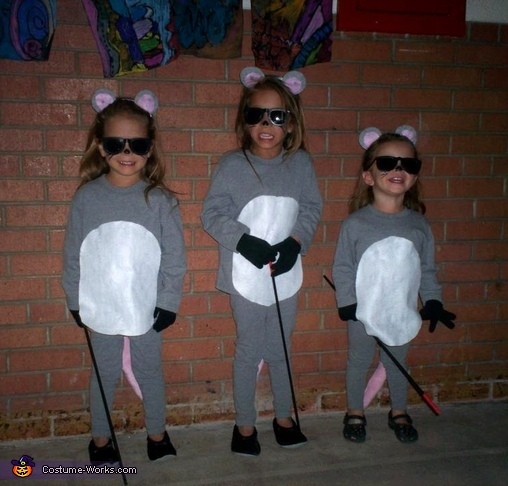 To finish the costumes off; black shoes and black gloves.This is an easy group costume of The Three Blind mice that has a cost of under $50 for all three costumes; with reusable shirts and leggings. I love this creative set. They are so cute!! !